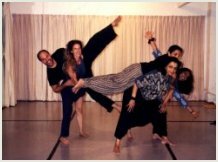 Holding your partner and bearing their weight…falling and trusting them to catch you… these are not normally activities we associate with Bharata Natyam, a traditionally solo dance form. And yet they do have a role to play even for Bharata Natyam, as Anita showed us in the course of a two-day workshop at the Bharatiya Vidya Bhavan in London. Where there are usually lines of students stamping the Tattadavu, this weekend found us in groups, trying to cross to the other side of the room while maintaining at least some sense of group choreography. 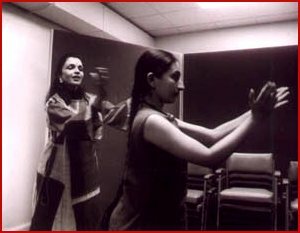 These exercises provoked an awareness that we classical Indian dancers often do not have. What are my other group members doing? How can I support them through my dance? If I perform this movement what effect will it have on the group composition? What shape will it conjure for the audience? 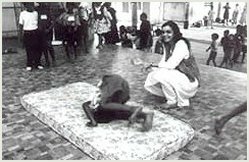 Could I do something more interesting to vary the levels being used – floor or aramandi or standing? The same was true of another exercise, when Anita asked us to show emotion with our backs to the audience. Surely our dance forms were never meant to be performed with a complete disregard for angika abhinaya - yet isn’t this often what we do? We show a hand movement and frown or smile and think that’s enough. Anita challenged us to think again. So we tried – how to really bring the feeling into the whole of our body, the whole of us! Later on in the workshop, as we practised a jathi, all the things we had done kept going through my mind: what shape am I showing here? Which level am I at, how much space am I covering? Is my dancing aware of the person next to me or is it obstructing them? 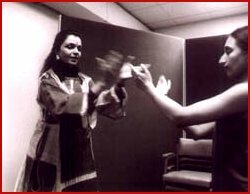 I left the workshop with images and an awareness that can only enrich and strengthen my dance – and I will never again attempt to show sringara by holding a kilaka mudra to the side and leaving it at that!